rocky's bru: Malaysia, a failed state? Leadership in Challenging Times. 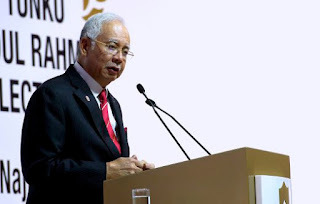 The following are excerpts from Najib Razak's speech at the Tunku Abdul Rahman Lecture in Kuala Lumpur yesterday, 20/8/15. I have selected these bits to underscore some of the facts the naysayers do not want us to ignore: that the fundamentals have indeed improved during the last half a decade and that we are a long way from being a failed state. Even Ambiga has stopped likening us to Myanmar, if you hadn't noticed. To read the PM's entire speech, please click H E R E.
19. Some are so desperate to cast our record in a bad light, that they have even said that Malaysia is on its way to becoming a failed state. 20. This is ludicrous. But let the facts speak for themselves. 21. From 2009 to 2014, Malaysia’s Gross National Income grew by 47.7 percent. 22. 1.8 million jobs have been created since we established the Economic Transformation Programme in 2010. 23. We have reduced the deficit for six years running, and in each of the last five years, total investments have reached new records. 24. Since 2009, the income of the bottom 40 percent households has increased by a compound annual growth rate of 12 percent, even higher than the national average of 8 percent. 25. Through the implementation of minimum wage legislation, the government has lifted 2.9 million people immediately out of absolute poverty. 26. Unemployment has declined to under 3 percent – from 3.7 percent in 2009. 27. We have increased women’s participation in the workforce, with a higher percentage of management positions in Malaysia being held by women than in Hong Kong and Singapore. 28. And we have maintained the reforms necessary for Malaysia to reach the goal of becoming a high income status nation by 2020. Some of these reforms have not been popular, like the introduction of GST and the removal of subsidies. But I am here not to make popular decisions; I am here to make the right decisions. Saying we could achieve strong growth without hard choices would be to make empty promises. 29. We had to broaden our tax base and reduce our dependency on oil and gas revenues. Every serious economist around the world agrees that these reforms were necessary and will benefit Malaysia in the long run.  Growth likely to remain healthy in 2015, despite lower energy prices – and it has. Growth for the second quarter was a strong 4.9 percent.  End of fuel subsidies and start of Goods and Services tax is timely, and good for efficiency, equity, and the environment.  Exchange rate flexibility will help non-energy exports. 31. The IMF does not hand out compliments lightly. Nor do the ratings agencies. Yet in January, Moody’s maintained Malaysia’s A3 rating with a positive outlook. In February Standard and Poor’s maintained Malaysia’s A- rating with a stable outlook. More recently, Fitch maintained Malaysia’s A- rating – and actually upgraded its outlook from negative to stable. 32. Despite the volatility of the world economy, other organisations, including the World Bank and the World Economic Forum have placed us high in their rankings for ease of doing business and competitiveness. Bloomberg rated Malaysia as the world’s 5th most promising emerging market in 2015. 33. And an independent study, which has nothing to do with us, recently declared Malaysia to be the top country for the Global Islamic Economy Indicator 2014-2015. Malaysia led by a large margin. Does that sound like a failed state to you? We can dance around many things to justify one or another. US markets crash today. 3 days in a row. More than 5% corrections. Maybe markets resume its trajectory upwards. Or it can fall another 5%. Nobody knows. What is more important is Najib's proactive reactions. So far none. Please focus on the dead elephant in the room. 1mdb issues won't go away. Oh I kill your Mom, but I give your Dad a job....does this makes me a criminal? And yet in all this fluff there is no explanation of why 2.6 billion came into his account. That screams "failed state" to the world. That's why FDI is down by 41% - says Tok Pa. He's made the country an international joke. What a failed mind to think that failed state is only about economy indicative. A failed state are also state that blantant coruption are done and cosider it donation, police protect the criminal and freedom are curled by puting fear. Currency have devalued by 25%,oil price are low and moral of people are even lower. The trust in government and BN are gone because of injustice and aragonce of its leader in staying to power. This is rather pathetic and grasping at straws. Top country among Islamic Economies? Most of the failed states in the world are Islamic countries and you are proud to the one-eye Jack in the kingdom of the blind? I am sure Malaysia will come out tops if it compares itself with Zimbabwe, North Korea, Erithea, Ethiopia and Timbuktu. This dude is way too polite. kesian rocky.... cut n paste jer? work harder la Dato'. ajibgor spent billions on CONsultants fee but only get 5% gdp growth. what we need is less politics in education, visionary and clean leaders. that's all and ajibgor has none of it. Get it ??? Contrary to the opinion of many that the country is on the verge of an economic collapse due to the weaker ringgit, independent macro-economic analyst, Professor Dr Hoo Ke Ping said that such negative sentiment was not based on facts. Hoo substantiated his views by presenting several points to prove that the current ringgit depreciation is actually not the same as experienced during the 1997-98 Asian Financial Crisis, which then had affected Malaysia and and other emerging economies in the region. “One of the ways to determine how bad our economy is doing is by comparing its current performance with the worst period we have ever performed. “So in comparison with what we endured during the 1997-98 Asian Financial Crisis, this is just a minor economic setback. “Mind you that in 1998, our market share collapsed, it was cut down to more than 70 per cent whereas currently it is only down to 15 per cent. “Also, at that time our foreign debt is approximately US$160 billion and we only have around US$ 20 billion reserve…now our total foreign borrowing is not even US$ 35 billion while our reserve is at best, US$ 99 billion,” said Hoo. In terms of domestic debt, Hoo explained that while our current debt is relatively high but it is still less than 100 per cent to our gross domestic product (GDP) ratio whereas in 1998 such debt had easily exceeded 158 to 200 per cent to GDP. Hoo also clarified that there is no reason for Malaysians to panic because the current currency depreciation has not escalated into a regional crisis. “Unlike now, in 1998 there was a huge regional crisis. Several countries almost went into bankruptcy they are South Korea, Thailand, Indonesia and even Hong Kong which was known at that time for having a good economic governance. “Even Japan too almost went bankrupt in June 1998…so back to the present situation, do you see any other countries within our region that is facing bankruptcy? No. “So if there is no regional crisis implicating us and our neighbours, there is actually no reason for us to panic. Despite the odds, our economy are still strong,” he said. In terms of political crisis capable of upsetting the ringgit, Hoo claimed that though Malaysia’s current political scenario is “lively”, it is not as severe as it was in 1998. “Anwar Ibrahim who was at that time the finance and deputy prime minister tried to overthrow Mahathir with the help of Madeleine Albright (US former secretary of state). “So Mahathir had to take control and bring order to the house by sacking Anwar which inadvertently sparked more political unrest. “Such unrest was one of the primary factor that led to the downfall of ringgit to RM4.71 to US$1 in 1998. “But today we don’t have any Madeleine Albright to create another Anwar. The only thing we have right now is John Kerry (current US Secretary of State) that is shaking Najib’s hands…and even Obama (US President Barrack Hussein Obama) is on good terms with Najib. “Hence, there is actually no global political power that is trying to upset the ringgit right now. Not only failed, but a screwed up state under Nacheat. We are halfway in becoming like third world countries like Congo, Zimbabwe etc. No, those are NOT economic indicators... they are just statistics! For example, 1.8million jobs have been created since 2010... but, it doesnt say how many of those jobs are for Malaysians, does it??? Aiyah... typical "statistics and lies!" Our PM Najib is the greatest PM in the world and even the Arab know this fact and are willing to donate RM 2.6billion to him. We should respect him more now. Respect! Botak Chin also good in helping people but doesnt mean that he can be proud of. How can a liar & corrupted guy be a Prime Minister? Because he can show some good trending in growth etc? Peerah. Gone forever...those people dont care about the party or country. All corrupted & super liar.